First Line: A thousand feet above the Russian front, a German scout plane weaved among the clouds, searching for a place to land. In August 1941 the German Army is a juggernaut, racing to lay waste to the cities of Stalingrad and Leningrad. During these crucial days, a German scout plane is forced down outside of Pushkin-- a town formerly known as Tsarskoye Selo, home of the summer palace of the Romanovs. The only thing in the briefcase of the German officer in the plane is an unimportant painting of a red moth. Or is it inconsequential? With his country teetering on the brink of disaster, Stalin suspects some sort of German plot, and he has just the man to get to the bottom of it-- his old adversary Inspector Pekkala. With the help of his assistant Kirov, Pekkala finds himself on the trail of the most formidable art thieves in history, whose target is a prized Romanov possession, once considered to be the eighth wonder of the world. In order to save this treasure, Pekkala will have to go behind enemy lines and outfox the invaders-- or face Stalin with his failure. Sam Eastland's Inspector Pekkala novels have been among my favorite historical mystery series since the first book, Eye of the Red Tsar. The books' setting of Stalinist Russia tends to be cold, bleak, and brutal (in other words quite truthful) so I don't read them like potato chips. No, these books I hoard, pulling one out to savor every so often. I don't even read the synopsis; I just pull the next book in the series from the shelf, open it, and begin to read. 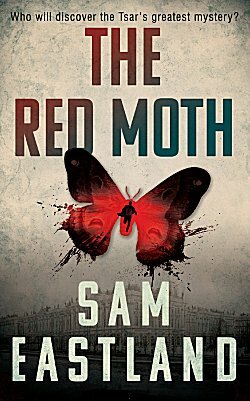 Opening The Red Moth was like sitting down to a banquet prepared just for me: a setting I can see and touch and hear and taste, a strong, memorable main character, a fast-paced "how's-he-going-to-do-it?" story, and a treasure that I've always hoped would be found. The indomitable Pekkala is a Finn who-- you would think-- would not be employed by Stalin at all for he first came to be known as the Eye of the Tsar, Nicholas II's private investigator. For that particular crime, Pekkala spent nine years in Siberia doing a solitary job that killed everyone else who did it in six months or less. But regardless of his history, Stalin recognizes the man's worth. Pekkala has always been the one man who can never be bribed or bought or threatened. As his assistant Kirov says, "Sometimes I think the reason Stalin gives you the worst assignments is not only because no one else can solve them, but because nobody else could survive them." While Kirov is kept in Moscow to solve a mystery there, Pekkala joins forces with Stefanov the Soviet anti-aircraft gunner, and cryptoanalyst Lt. Churikova in Tsarskoye Selo to keep the fabled Amber Room out of Nazi hands. The two-headed approach is a good one because those readers who have been following the series need to know if Kirov can actually solve crimes or if he's just been riding Pekkala's coattails the entire time. And Pekkala trying to keep seven tons of amber worth ten times its weight in gold out of the hands of the worst art thieves the world has ever known? Ah, the part of me who loves Indiana Jones savored every twist and turn of the adventure. The first three books in Sam Eastland's series were published in the U.S., but to go further you may find yourself tracking down the U.K. editions (which isn't difficult). Believe me, they are well worth it for their fantastic sense of place, for Pekkala the man of granite, and for the stories. If you enjoy historical mysteries, you definitely need to give these a try. This sounds really interesting, Cathy. And I do like a historical series, especially when you get a real feel for the time and place. Glad you're enjoying it (the series).